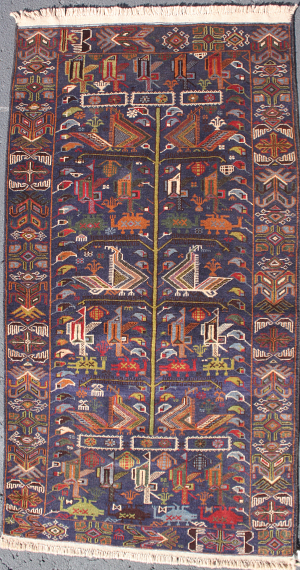 This red white and blue Gul i'Barjista rug features a repeated motif of a large floral Tree of Life sprouting from the bottom (and top) of the rug, growing towards the center. At the bottom of the motifs sit small intricate planter-like buildings from which plants sprout. Three helicopters labeled "ENTEN' fly above the tree below a large medallion and a cluster of flowers which sit in the center of the runner. Perfect. Excellent quality. 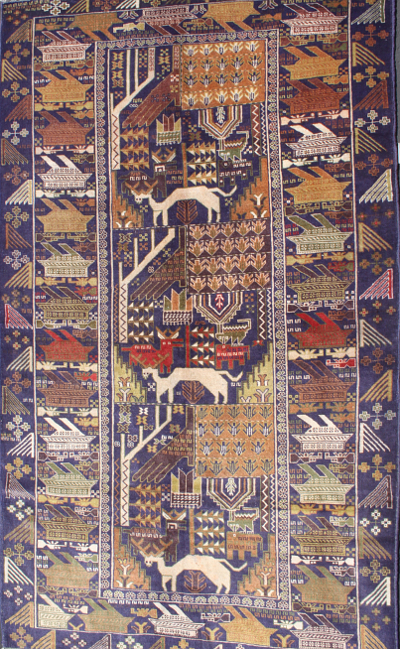 The colors in this rug are vibrant and rich. A strong lime green line runs down the center of the rug, the 'trunk' of the Tree of Life.